Sir James said his company needs to 'relentlessly invent' to maintain long-term success. 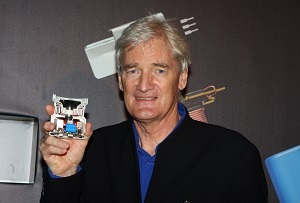 Sir James Dyson today committed to ploughing £1bn into R&D as his eponymous company plans to launch 100 products in the next four years. Construction has begun on a new campus at its Wiltshire HQ, in a programme that will create 3,000 new high-skilled jobs. 'Our growth is fuelled by technology and we are thinking long term – 90% of our technology is sold abroad, we’re quickly growing across Asia, and it’s phenomenal to think that we are now number one in the home of technology – Japan. It is like selling coal to Newcastle,' said Dyson, who came 25th in MT's Top 100 Entrepreneurs this year. Initially famed for its bagless vacuum cleaners, the company has since moved into other products, including its Airblade hand dryers and bladeless fans. In September it announced the launch of a robotic vacuum cleaner, the 360 Eye, which is due to go on sale next year. On top of the £1bn for research Dyson will invest a further £200m in its Singapore production plant and £50m with British universities. In February the firm announced a £5m tie-up with Imperial College London for a robotics research lab. That's a whole lot of money being bet on innovation, but given Dyson's track record he's certainly got a good chance of success.